Time rolls on as always. Meanwhile the French Baroque keeps calling to me and I respond! Really good period performances are out there lately and I will bring them to you as I get to hear them. 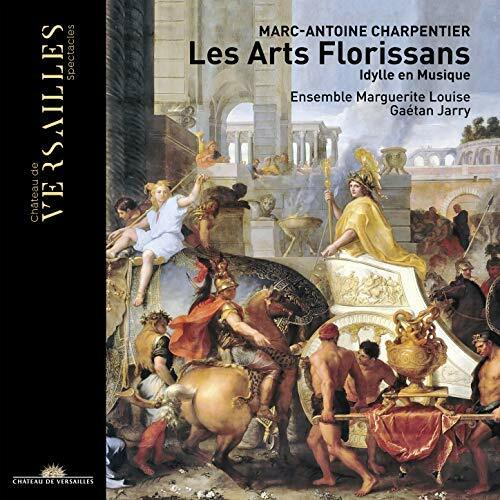 Today we turn to the potent and poetic composer Marc-Antoine Charpentier (1663-1704). We contemplate a major operatic work, a five-scene allegorical divertissement meant to celebrate Louis XIVth's reign, of territorial expansion and things that patrons generally foot the bill for in those days. And so we have Les Arts Florissans and a brief related work L'Couronne de fleurs. We hear both works in ideal performances by the Ensemble Marguerite Louis under the very capable direction of Gaetan Jarry as part of the Chateau de Versailles Spectacles series released on the Chateau de Versailles label (release 001). In this excellent program of both works we get all the reasons why the French Baroque in general and Charpentier in particular are a thing apart. This music has a sweetness not ordinarily a typical part of the Baroque. There is lyrical heft, which period performances bring out well in part for the string sonarity the way it is meant to sound, but also in this case the winds and their plaintive melodiousness. Then in a performance such as this, the vocalists too have a genuine warmth that goes with the entire ambiance. Soloists and small choral group alike sound as angelic as they should. The quality of the invention too is of the highest order. Without that we would have sweet trifles, confection without nutritive value. Not here. This is not an extraordinarily contrapuntal music, and that is true in many ways of the entire French Baraque, as I remark the other day in my review of the Lully Effect (see that review in the index). Yet it is there in the continuo certainly, the bass lines especially, and at times in the vocal parts. This does not have the incredible contrapuntal brilliance of a Bach. But it makes up for that with an immediacy of melody line and a productively lyrical intensity we respond to all quite willingly and happily, or I do anyway. It is music of definite substance. One would find fault with these performances with great difficulty. The music sounds as great as it is, as poignant in the delivery as in its latency as written score. This is what Charpentier should sound like. And what that is certainly makes for a most exciting and lovely musical excursion. Brilliant! Highly recommended.